Organizers of the 2011 Independent Games Festival are pleased to announce the jury panel that will determine the finalists and winner of its Excellence in Audio award, a category which seeks to highlight the best musical & sound innovation, quality, and impressiveness in independent gaming. 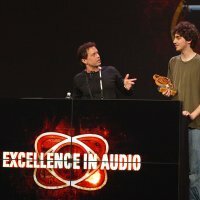 Prior finalists and winners of the IGF Excellence in Audio award, which will be given out at Game Developers Conference 2011 next March, earned recognition for games that took an entirely new and unique to approach to sound in games or otherwise excelled at their craft. These have included Queasy Games' abstract acoustic guitar shooter and 2007 award winner Everyday Shooter, 2008 finalist guitar-controller platformer Fret Nice, 2009's ultra-stylized finalist PixelJunk Eden from Q-Games and Osaka musician/DJ Baiyon, and the atmospheric 2010 award winning Closure (pictured). This year, the jury will receive recommendations from the wider body of over 150 IGF Main Competition judges (itself including notable former IGF winners, finalists and indie game notables including Ron Carmel, Andy Schatz, Ramiro Corbetta, Kellee Santiago, and Olivier Lejade) as they consider the merits of each of the five finalists and eventual award winner. "Independent games are at the forefront of recognizing the true potential of music and sound in games," said festival chairman Brandon Boyer. "Beyond simple soundtracks and scores, the indie gaming community has been crucial in exploring the space where mechanics and audio can play together, and for veering radically from traditional musical expectations to create fantastically unique ambience. We're all excited to hear what this year's entrants have created!" The announcement is the second in a series revealing specific juries for each IGF Award, following the debut of the Nuovo Award jury, including notables like Jason Rohrer, Clint Hocking, Rod Humble and Ian Bogost. All entries in the 2011 Independent Games Festival -- part of the UBM TechWeb Game Network, as is this website -- are currently browsable at the IGF's official site, where more complete biographical information on the Audio Award jury is now available. The five Excellence in Audio Award finalists will be announced -- along with a jury statement detailing the thought process behind selecting its lineup -- in early January 2011. All finalists will be playable at the IGF Pavilion on the show floor during Game Developers Conference 2011, with the winner announced on the evening of March 2, 2011 at the IGF Awards.